Dr. LouAnn Woodward, UMMC vice chancellor for health affairs and dean of the School of Medicine, shakes hands with Ed Parkinson, acting CEO of the FirstNet Authority, after each signed a memorandum of understanding between the two organizations aimed at improving emergency medical response communication and connectivity in Mississippi, especially in rural areas. Standing behind them are, from left, U.S. Sen. Cindy Hyde-Smith, Gov. Phil Bryant, U.S. Secretary of Commerce Wilbur Ross and Medical Director of the UMMC Mississippi Center of Emergency Services Dr. Damon Darsey. The First Responder Network Authority (FirstNet Authority) and University of Mississippi Medical Center this week signed a memorandum of understanding to collaborate on innovation for emergency medical care and response as well as mobile broadband for rural first responders in Mississippi and nationwide. Gov. 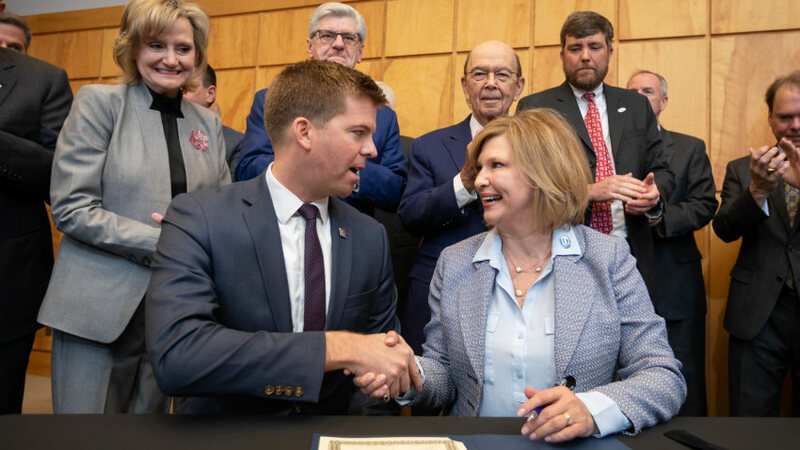 Phil Bryant, U.S. Department of Commerce Secretary Wilbur Ross and U.S. Sen. Cindy Hyde-Smith joined executives from the FirstNet Authority and UMMC officials at a signing ceremony this morning on the UMMC campus to unveil the agreement. The FirstNet Authority, within the U.S. Department of Commerce, is responsible for ensuring the buildout of FirstNet, the only dedicated nationwide broadband network for America’s first responders. As part of its mission, the FirstNet Authority is working to better understand the needs of first responders operating in rural communities, where communications are often a challenge. UMMC, Mississippi’s only academic health sciences center, established the Mississippi Center for Emergency Services to help the state maintain medical services during emergencies and disasters. Supporting that mission is UMMC’s extensive telehealth network, which in 2017 was designated one of two Telehealth Centers of Excellence by the U.S. Health Resources and Services Administration. Together, the FirstNet Authority and the Mississippi Center for Emergency Services will drive innovation for rural emergency medicine and response and share case studies, lessons learned and best practices related to public safety’s use of mobile broadband in rural areas. “We established the Mississippi Center for Emergency Services in part to help improve the knowledge and capabilities of first responders statewide, especially those serving the most remote areas,” said Dr. LouAnn Woodward, UMMC vice chancellor for health affairs and dean of the School of Medicine. “We can handle the medical support training and emergency response communications, but we need partners to help us with the technology necessary for every part of the state to be connected to potential life-saving support in real time. Through this collaboration with UMMC, the FirstNet Authority will gain critical insight into how medical incidents are handled in rural communities— specifically, how first responders can leverage innovative technologies to improve medical response and patient outcomes. The FirstNet Authority and the Mississippi Center for Emergency Services plan to create demonstrations related to rural first responders’ use of broadband to be incorporated into the FirstNet Authority’s new experience program. This program aims to introduce first responders to current and future technologies through hands-on educational and learning experiences. The agreement also represents the first step toward establishing the FirstNet Authority’s University Program. The FirstNet Authority plans to partner with universities with expertise in different aspects of public safety communications to enhance the network and educate public safety employees on how best to use cutting-edge technologies.